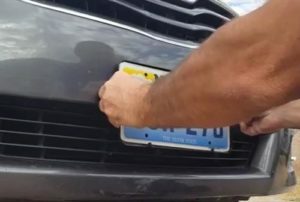 Installing the front license plate on a Toyota Camry 2007-2011 is an easy task that most home DIYers can do. 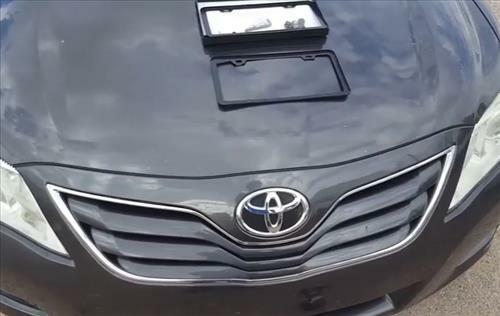 The problem with Toyota Camry is there is no bolts or bracket on the front to hold a plate in place. This is easily solved by buying a bracket and some screws to hold it in and attach it. There are many brackets to choose from depending on the color and style wanted and is about preference more than functionality. I bought a low cost basic black bracket in Amazon which worked well for me. It also had a rear plate holder which I needed. Here are the steps I used to install the front license plate on a 2010 Toyota Camry. As always call a professional if you have any doubts about doing it yourself. 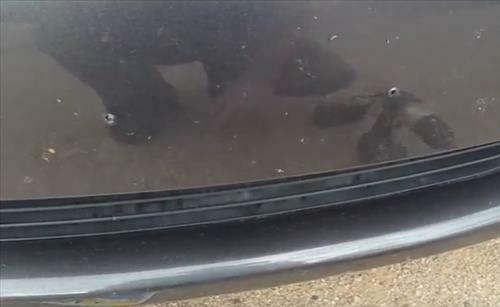 1… The first step is to center the plate so holes can be drilled into the bumper. The front of the car is fiberglass so while a drill is helpful it is not needed and can be done with hand tools. This 2010 Toyota Camry already had the holes drilled so it was easy to center the plate. 2… A drill bit can be used to make the holes or self taping bolts like I are used here. Self taping screws are easy to use when no drill and bit are available. 3… Insert the plate into the bracket. 4… Tighten the bolts in. 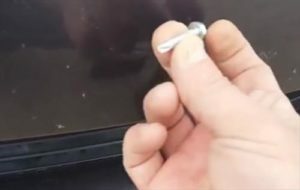 Bigger sized bolts can always be bought at a hardware store if needed.